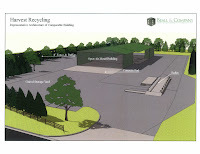 The Oconee County planning staff has determined that a proposed materials recycling facility on Dials Mill Road in the northwestern part of the county is not consistent with the surrounding area or with developmental goals for that part of the county. If the facility is built, the staff has concluded, it “could negatively affect the ability for all of the properties adjoining the site” to be developed consistent with county land use plans. As a consequence of these and other identified problems, the staff has written that it “does not recommend approval” of the special use permit that Bernard A. Garrett is requesting for a 9-acre parcel within a 39-acre piece of property at 1441 Dials Mill Road. The Planning Commission is set to consider the staff report at its meeting on Monday. The Planning Commission makes recommendations to the Board of Commissioners, which is scheduled to take up the permit request from Garrett at its meeting on May 7. Sherry Tirri, who, with her husband, lives at 1190 Dials Mill Road, spoke up against the permit request at the town hall-style meeting the Board of Commissioners held at the Bogart Community Center last night. Tirri said she believed the facility will cause problems for people in the area and asked citizens to attend the meeting on Monday night. Only 16 people turned out at the meeting in Bogart, and relatively few of those who did asked questions of the commissioners. Sen. Bill Cowsert, Rep. Regina Quick and Rep. Chuck Williams, all representing Oconee County in the Georgia General Assembly, fielded most of the questions, which dealt with changes in the tax on the sale of automobiles, taxes and spending generally, redistricting, and other issues dealt with in the General Assembly session in Atlanta just completed. Tirri did not ask the commissioners to respond to her concerns about the request by Garrett, and none did. Beall &Company is representing Garrett in the permit request process. The property is zoned for agriculture, and Garrett is asking for a special use permit so he can retain that zoning category but operate the recycling facility within it. The staff report, written by Planner Brad Callender, states that the site has been used historically for agricultural production, composting and wood chipping. The report does not identify the owner of the waste containers or portable toilets on the site, but the Garrett Family operates Roll Off Systems from 1100 B. Garrett Road, north of the property proposed for the recycling facility. Bernard Garrett is listed as the owner of that property in county tax records. That company, according to its web site, provides dumpsters, portable toilets and recycling to a service area stretching from Atlanta to the South Carolina border. The property at 1441 Dials Mill Road is designated on the 2030 Future Development Map as Suburban Living and Country Estates. “If the special use request is approved, the normal and orderly development of surrounding properties as intended for this vicinity of the county will be negatively impacted,” Callender wrote. Residential development already exits along Dials Mill Road, the report states, and the developers of Wildflower Meadows subdivision, just north of the site, have submitted plans to restart development of that single-family subdivision. The report also raises questions about the traffic created by the facility. Dials Mill Road, according to the report, currently is designated as a “No-Through Trucks” roadway. The Planning Commission meeting is scheduled to start at 7 p.m. on Monday in the courthouse in Watkinsville. The Board of Commissioners meeting on May 7 also is to start at 7 p.m. and also is to be held in the courthouse. The public is given a chance to speak for or against the special use request at the meeting before the Planning Commission and at the meeting before the Board of Commissioners.